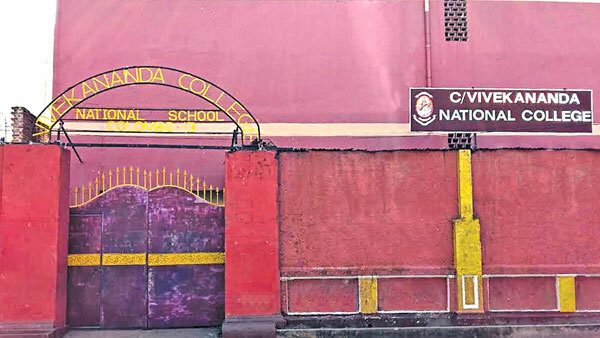 Vivekananda College, founded 90 years ago and during British rule, was the first Hindu school that was set up in Colombo to uplift education in the island. It was setup thanks to the efforts of Swami Vipulanandar and Swami Sachithanandan on March 24, 1926, and drew its inspiration from the historic visit to the island by Indian spiritual leader, Swami Vivekananda in 1897. The school's first Principal was K. Arunachalam and the first manager was Arunachalam Mahadeva. Swami Vivekananda's views on education can be encapsulated by the dictum, 'become a good human being - make a good human being'. The motto of the school ("Be and Make") drew from this thought while the school song, authored by Ponnambalam speaks of bringing together energy, education and wisdom. The school admitted both girls and boys from its inception. In 1953 and 1963 the school began preparing students for the O/L and A/L exams. In 1967, the school was able to produce its first university entrant. All this happened at a time when the school was relatively impoverished in terms of physical facilities. The lack of classrooms was a major problem. However, undeterred by this, the students and teachers decided to have classes in the evenings as well to circumvent this problem. The evening classes which commenced in 1954, were an integral part of the educational programme until very recently. In recent years problems such as the lack of electricity and buildings were resolved. However, it is interesting that the school recorded what is widely held as its Golden Age (1972 to 1983) amidst these problems. That was the time of Principal Maheshan. He dedicated himself to the development of the school. He worked tirelessly, day and night, and also obtained the help of people in the neighbourhood, even going on house-to-house campaigns. The school formed an Eastern Girls' Band in 1978. The band distinguished itself and brought much honour to the school at the World Hindu Congress held in Sri Lanka and when the King of Nepal visited the island. This was also the only girls' band representing Tamil schools during ceremonies to fete Queen Elizabeth when she visited Sri Lanka in 1981. In 1990 a temple dedicated to God Ganesh was built in the school premises with the intention of creating an environment that was conducive to religious activity. One of the most significant developments as far as the school is concerned was it being recognised as a 'National School' in 1996. In this school where Sinhala and Muslim teachers share the staff room with their Tamil colleagues there is one exceptional educator. W.C. Fernando who joined the tutorial staff of the school in the early '80s retired as a Deputy Principal, a unique distinction for a Sinhala teacher in a Tamil school. Today the school has a student population of 2,086. There are 99 teachers. The non-academic staff comprises 16 persons. There are both Tamil as well as English medium classes in all grades. Those who perform best at examinations in all subjects in all grades are rewarded at the annual prize giving. This has been a great incentive that has spurred all students to constantly strive to do better in their studies. Present Principal R. Ramaiah referring to the momentous occasion of the school celebrating 90 years said: "The contribution of this school to education in the Tamil Medium in Sri Lanka over the past nine decades is invaluable. We should not spare any pains to ensure that this tradition continues into the future. Principals, teachers and others come and go. What is important is that the cherished ideals on which the school was founded live on for the betterment of our children and the society they graduate into once they leave school." Perhaps one of the crowning moments of the school and one which constitutes a recognition of the important role in plays in present day Sri Lanka is the fact that its students were among those selected to sing the National Anthem in Tamil for the first time ever at this year's Independence Day celebrations.